Unleash your inner guitar hero with this starter kit essential. Pick like the professionals, and receive a standing ovation with the classic 41" Acoustic Guitar from LyxPro. Acoustically crafted for superior resonance and powerful sound projection, this natural-wood beauty entertains a crowd while treating your fingers to an exceptional strumming experience. Whether you're learning classical guitar or jamming to your favorite rock songs, our high quality light gauge steel strings, super smooth fingerboard, durable wire frets, super stable bridge and anti-scratch pickguard ensure rich, vibrant music and long-lasting comfort. Guitarists of all ages also enjoy universal playability thanks to the neck's adjustable truss rod, stainless steel tuning knobs and prepositioned fret markers. So go ahead-put your skills on full display, and take advantage of the best value for professional performance. 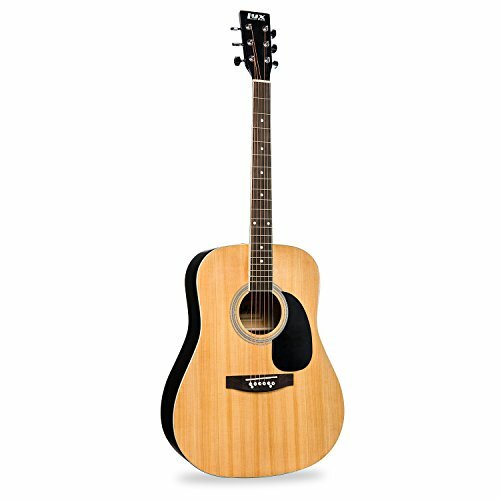 Add a LyxPro Acoustic Guitar to your cart today! - A 6-string that's perfect for pros and durable for dummies! - Measures 41" x 15.25" x 4.25"
- Grab a stand, bag, strap, stool and other LyxJam gifts and accessories!